I'm very happy to announce that my new book is now available on Amazon. 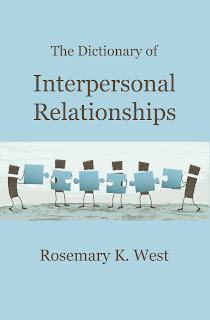 From the description on Amazon: This fascinating reference work covers all aspects of interpersonal relationships. With over 1600 entries, it includes vocabulary from literature, psychology, sociology, anthropology, and linguistics, as well as informal terms and well-known sayings. The insightful explanations of key concepts are especially useful. The Dictionary of Interpersonal Relationships is an indispensable source for writers, students, researchers, and anyone looking for a deeper understanding of the language of human interaction. Clicking on the image will take you directly to the book's page. Or, you can see all my titles on Amazon's Rosemary K. West page. I am looking forward to seeing this!